- So far four deliveries this year, with another six due before the end of the year. - Airbus describes the customer acceptance process as "painful". - Airbus recently missed a significant milestone to introduce military capabilities to the type. - The so-called standard operating capability 1.0 was due to have been attained by 1 November. - Airbus’s failure to do so has triggered a contract clause enabling European customers to cancel their orders. - However, Airbus said European cancellations are unlikely. - Aerial delivery, in-flight refuelling and self-protection "the key capabilities to be in the course of the next year". What we leave behind is not as important as how we've lived. Not as smooth as the A350 but not a 787/A380 disaster either. This plane is going to be around for a long long while! Read somewhere yesterday that both the A400 and A350 are bigger drains on Airbus financials than expected, and there will need to be some pricing adjustments upward. Wish I could find the article. Airbus’s failure to do so has triggered a contract clause enabling European customers to cancel their orders. Isn't that what they always say???? However, Wilhelm says all nations working through the auspices of the OCCAR procurement body – Belgium, France, Germany, Luxembourg, Spain, Turkey and the UK – would have to agree “unanimously” to terminate their combined 170 orders. “That is why we see it as unlikely,” he says. Thanks.. however we'll just have to wait and see..
Well the A400M was certified as a civilian aircraft pretty quickly, although I'm sure it was easier than for an airliner (no need to make an evacuation test for example), it's the military capabilities that are more difficult, and knowing how the program has been a mess precisely because too many various capabilities were demanded by various countries, it isn't very surprising. However, in parallel with the capability improvements, Airbus will continue with deliveries and “industrial ramp-up”. But Wilhelm concedes this is “not the most cost efficient way to do this”, due to the need for retrofit programmes for aircraft that have already been handed over. So we have a situation similiar to the A 380 production where the had to solve the wing-brackets-issue on airframes already delivered. The only positive thing is that the numbers of units already delivered / being deliverded until introduction of the improvements into serial production is much smaller. Any news on the delivery of the first German A400M except for the information included in that article ("delivery imminent")? So do I understand it correctly, that the aircraft is able to perform its standard duties, such as transporting goods in a "civilian manner" but that tactical capabilities, eg operating into war zones are not in the envelope as of now? Meaning that the aircraft still is useful in the meantime? Not as smooth as the A350 but not a 787/A380 disaster either. Neither the B-787, nor the A-380 were delivered 5 years late. it's the military capabilities that are more difficult, and knowing how the program has been a mess precisely because too many various capabilities were demanded by various countries, it isn't very surprising. Airbus originally said they could build in those capabilities. I might add these military capabilities are real world capabilities needed by the customers. But Airbus just wasn't up to the task, and had to renegotiate the contract with OCCAR (and all 7 EU countries) a less capable aircraft (no TFR, limited tanker capability, etc.) for a higher cost. Yes, it still has limited value as a "trash hauler" of "bullets and beans". It can still transport troops. But to my knowledge France, Turkey, nor the UK have certified, for themselves, the ability to drop paratroopers in a combat zone. This, like the Luftwaffe need for TFR capability, is a critical combat capability. Well Airbus says to deliver 6 more A400M aircraft in the coming 6 weeks (i.e. before the end of the year). Germany next month I suppose. Germany next month I suppose. I thought the German airplane was due this month? Following on from the IOC configuration, which equates to an aircraft suitable for basic logistic transport tasks, comes SOC1. To be declared in late 2013, this will add basic aerial delivery to the A400M's performance range. Each following after roughly one-year gaps, the subsequent 1.5 and 2 standards will respectively add full aerial delivery and tanker capability and enhanced tactical mission management and new functions such as polar navigation and time-on-arrival management, says Airbus Military. Arriving in late 2017, SOC2.5 will deliver "enhanced tanker capabilities and search-and-rescue patterns". The final, SOC3 standard will bring in advanced capabilities including low-level flight functionality. Initially, the third French A400M – foreseen to be delivered at the end of the year 2013 – should have been delivered in a SOC 1 configuration. For different reasons, this has not been possible and the first A400M to be delivered in a SOC 1 configuration is supposed to be the first British A400M – planned for rollout September this year. And now it's delayed again. Quoting KarelXWB (Reply 9):Germany next month I suppose. 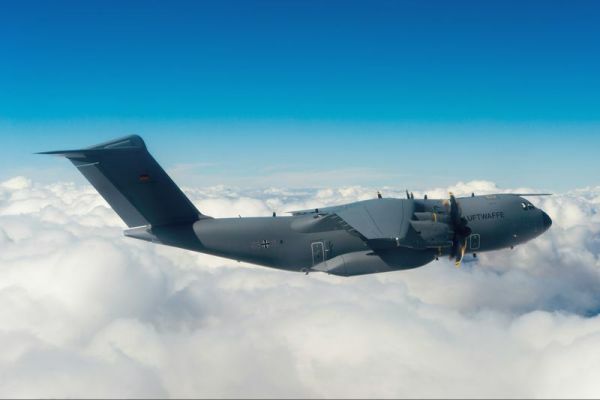 The Wunstorf Air Base now announced that the first A400M will arrive there "at the beginning of December". get into or out of a contested Landing Zone?? IF the A400M can't do any Combat tactical flying? Had to endure over the last 50+ years. Some of you Said it would, now it's high time to see it perform. I asked them to find it and to add a gravure "Dear N14AZ, on behalf of Ms. Merkel we would like to thank you for your contribution. Thank you, thank you, thank you!" Quoting KC135TopBoom (Reply 10):Quoting KarelXWB (Reply 9):Germany next month I suppose. On a related note, I heard the first RAF A-400 was just delivered in the last day or two. Can anyone confirm that? All of this for a trash hauler Europe can call its own. One has to wonder how much $$$ or Euros could have been spent on other necessary pieces of equipment or training. C-17s and C-130s are/were available with a proven track record longer than the delays and problems this program has racked up. I guess style before substance in this case. Let me know when the brand new wonder plane makes it to the theater. By the time this thing makes any significant contribution, the US Army's Joint Mulit Role will be ready for fielding. 1st A400M to the RAF was delivered last thursday. C-17s and C-130s are/were available with a proven track record longer than the delays and problems this program has racked up. What benefit would using these have for Europe and European industry. Besides the C130 is a very very old design which is becoming to small for a lot of vehicles which are air transported these days. Delivery has slipped into January 2015. I have to correct myself: handover is planned before Christmas but delivery ceremony has slipped into next year. Europe or European industry? I thought this was about fielding the best possible equipment for personnel to defend one's nation. The C-130J or C-17 could have been purchased, fielded and put to use helping the Western world eradicate terrorists. How fast was the European designed Lakota fielded for US forces during the same time period? What benefit would using these have for Europe and European industry. um,... it would be a benefit to have aircraft that were actually in service. Seems like a significant benefit. I now heard the first airframe of the German Luftwaffe will arrive tomorrow, friday, Dec. 19, 2014. Is not the best possible equipment anymore, it's just been lucky that there hasn't been a modern competitive aircraft in it's class to take sales from it. If that's how you want to play it why design a new anything ever again when we already have existing products which will do the job? Meanwhile the 6th aircraft for the French Air Force has been delivered. Thanks for the update. That would make 8 deliveries in 2014 so far (5x France, 1x Turkey, 1x United Kingdom + Germany tomorrow), we're still two deliveries short. Quoting N14AZ (Reply 25):I now heard the first airframe of the German Luftwaffe will arrive tomorrow, friday, Dec. 19, 2014. Delivered! Taking-over was today, 54+01 will leave Sevilla tomorrow. Source: from the link above. Unfortunately, the weather is awful in Germany right now. It will be difficult to differentiate between the grey fuselage of 54+01 and the grey sky. So don't expect nice picture from the landing at Wunstorf Air Force Base. Touchdown at Wunstorf was at about 1pm during rainy and windy weather conditions. Then you can tell us what's what.. Right Now? All you have is an airplane. It's funny how fast you guys acknowledge the F-35 being already so advanced and more capable then anything flying. Right now all you have is an airplane.... You dont have PROOF. Go into a combat zone with the F-35 and we will see. However when a european plane is introduced it has to go to combat to dismiss the proof it's not totally usless obsolete garbage. This reminds me at the same discussion with the Typhoon. Some people were praising the almighty F-22 to the heaven and it's superiority trough stealth. Guess please which plane was proving itself in Lybia dropping Paveways while the F-22 was on the ground because it's readiness rate were below 50% and OBOGS issues? Flown on: DC-9, MD-80, Fokker 100, Bae 146 Avro, Boeing 737-300, 737-400, 747-200, 747-300,747-400, 787-9, Airbus A310, A319, A320, A321, A330-200,A330-300, A340-313, A380, Bombardier CSeries 100/300, CRJ700ER/CRJ900, Embraer 190. There was no proof the C-17 could do any of that before it did either, this is just another daft anti A400 comment without any validity. As I said before why build anything new if old can do the job just as well, well in this case I doubt it will take more than a couple of years before the A400 fully eclipses anything the 60 year old Herc can do. I'm also confidant the Embraer KC-390 will also help knock the C130 out of production. While I agree with you, it's not unusual to see such comments when so much of the press and fanboys tout features and theoretical performance before proven in other than test mode.. I try to take the releases with a grain of salt because truly some aspects are unknown until a specific situation appears. All you have is an airplane. lighten up.. there only a couple of these babies out there and nobody's going to risk them for anything yet. And when they do, they'll probably perform as well as expected. ighten up.. there only a couple of these babies out there and nobody's going to risk them for anything yet. And when they do, they'll probably perform as well as expected. I thought France has already used them in operational roles in Africa ? They did (see here), three months after hand-over of the first example. Just a cargo and PR (the French defense minister went along for the flight, apparently) mission on the sidelines of Opération Serval, but still that was quick. The second for Turkey has been delivered. Quoting strfyr51 (Reply 33):There's no PROOF the A400M is anyways Nearly as capable is there? I'd lay off that reasoning until the A400M has done HALF as much as the C130 series. Go into a combat zone with it and We'll see who can do What and to Whom . Let's see it do weather recon. Hurrucane hunter work first, Ocean Recon and SAR, Operate AT McMurdo Station in Antarctica like USN VXE-6 didThere was no proof the C-17 could do any of that before it did either, this is just another daft anti A400 comment without any validity. The C-17 was never marketed for anything but a strategic and tactical airlifter. In those roles it does very well. It was not marketed as a tanker, low level penetrator, gun ship, or anything but a heavy trash hauler. The first A-400M has been in service for over a year now and it has not fully demonstrated its 37 tonne capability, or its range capability with a significant load. Why is that? r. The first A-400M has been in service for over a year now and it has not fully demonstrated its 37 tonne capability, or its range capability with a significant load. Why is that? In a piece published on the French Ministry of Defense website on December 8, 2014, Capitaine Karim Djemai provided an update. The A400M was able in a single mission to support two operations: the first in Barkhane (under way in the Sahel-Saharan Africa since the summer of 2014) and the Sangaris operation (underway since December 2013 in the Central African Republic). MSN-8 named the City of Toulouse left the Orleans airbase for Africa in the morning of December 4th and stopped over in Italy to deliver 5.5 tons of cargo and 25 Italian soldiers involved in the European operation EUFOR RCA. This task was performed within the framework of the European Air Transport Command pooling of resources of which both France and Italy belong. Then the plane continued to Africa delivering a total of 50 passengers and about 18 tons of cargo. The load consisted of a mixed load, including technical and medical equipment, aerospace equipment to support the six Rafales stationed in N’Djamena and rotors for helicopters involved in the Sangris operation. As a strategic airlifter, the A400M Atlas has a capacity, speed and range which allows France to operate from its mainland bases to support operations….For example, the A400M can carry four times the load of a C-160 Transall in half the time. Since the official activation of the A400M squadron in September 2014, the plane has been used for logistical support. Eventually, the aircraft will be able to execute all of the core air transport missions, such as air assault (i.e. delivery of men, materials or paratroopers at the point of attack), air delivery, in-flight refueling and medical evacuations. The first A-400M has been in service for over a year now and it has not fully demonstrated its 37 tonne capability, or its range capability with a significant load. Why is that? That would be the $15 Billion question. Zeke, your knowledge is often refreshing, however, the quote you provided in this case doesn't answer TopBoom's question.. It's similar to the questions on the F-35 forum.. specific questions are answered with talking heads quoting "someday" capabilities from manufacturer sales pamphlets/briefings. I seem to recall the C-17 very soon after entry into service was put through all the capability (tonnage, range, etc) actions just to reassure the public they hadn't been fleeced.. (of course these revalidated the same tests were performed as part of initial aircraft testing as well).. So is the plane not capable, or is it they just haven't had an opportunity for grand PR displays? May be not quite, but the French have a lot of troops currently deployed in operations around the world. Besides any criticism: how much is the actual proven (during test flights) cargo capacity of the production standard A400Ms? I think what TopBoom is getting at is while they may have loaded the puppy up on one test, and flown till the tanks were empty on another test, those are carefully orchestrated events. Doing so in real conditions is better proving grounds.. Yes they have been using the planes but not a capacity in favor of more flights. If I remember correctly the first "unprepared runway" landing went bad because it wasn't prepared correctly (seems it was too wet).. so the test was revised to minimally prepared runways..